The movie, which will open in Las Vegas on March 3, is not only the best solo Wolverine movie but one of the best films to come out of the X-Men franchise. It’s ruthless, emotional, and is the perfect culmination of the 17 years Jackman has helmed the role. One of the real highlights of the picture are the performances. Stewart delivers a powerhouse performance as a broken Charles Xavier, and Jackman is in top form as one of the most tragic Marvel characters. However, while Logan is all about Jackman’s send off, Keen nearly steals the show. The young actress is the heart of this movie and makes every emotional scene more impactful. At the same time, when Laura needs to unleash her mutant powers in an action sequence, she’s unbelievable, and I’m sure we will be seeing a lot more of her on the big screen. 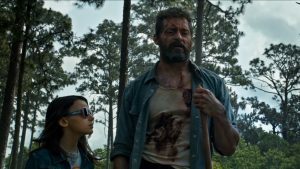 But, while Keen and Jackman shine, it’s the chemistry the two share that makes Logan such a stand out in the X-Men franchise. Their relationship is so complicated, filled with misunderstanding, anger, and love, that when the two interact you don’t know if they are going fight or embrace. To emphasize, the best part of the entire movie is on nearly every poster. It’s the moment when the young girl’s innocent hand wraps around the aching, bleeding hands of Wolverine. It’s the most beautiful moment in any of the X-Men movies. Opposite of this touching imagery, however, is the gory, heinous violence that will have audiences going cheering and maybe even covering their eyes. Let’s just say this movie earns its R-rating and Wolverine’s claws are covered in blood most of the time. But, the action doesn’t feel senseless. Logan, in fact, offers some of the best action sequences I’ve seen on screen in some time. Near the end of the second act, Wolverine goes toe-to-toe with…we’ll say a familiar face…and the moment is incredible. If you agree with the many fans that don’t think the movies have shown how ruthless Wolverine can be, all I can say is be excited. Now, Logan does have its issues. For instance, the 135-minute movie does lose its pacing in the middle and probably could have avoided this by cutting out 20-minutes to create a tighter experience. But, the biggest problem is that while the emotional beats land, they don’t land hard enough. This might be because fans and audience members are aware of the direction the picture, and franchise is going. Or, it could be because of some of the choices in editing (such as parallel action taking the focus off an emotional moment at hand). Either way, the moments just don’t feel as powerful as they should be. There was room to push the emotion and let the audience sit in those feelings. However, even with these issues, Logan was a hell of an experience. It offers solid action and great performances. It’s a successful culmination of 17 years of work on one of the most tragic comic book characters that have ever been.